Brenda Valentine, First Lady of Hunting and longtime member of the RedHead Pro Hunting team, and Frank Peterson, president and CEO of Recreational Boating and Fishing Foundation, will appear on Bass Pro Shops Outdoor World radio. Valentine, a dedicated hunter and conservationist, champion archer and award-winning TV show host, will share inspirational and funny stories about her life in the hunting industry. Peterson will discuss bold new strategies to introduce fishing to new audiences. Also joining the show is Laramie Lowe, general manager for KCOZ 91.7 College of the Ozarks Contemporary Christian radio station. He’ll be discussing how the Big Cedar Lodge Legends of Golf presented by Bass Pro Shops will benefit programs at the College of the Ozarks. The show will air Saturday, June 14 at 10 a.m. and 5 p.m.Eastern time on RURAL RADIO SiriusXM Channel 80. 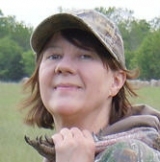 Brenda Valentine, First Lady of Hunting & RedHead Pro Hunting team member. Frank Peterson, president and CEO of Recreational Boating and Fishing Foundation.